Carolyn “Gumby” was born November 17, 1940 in Vandalia, IL to Rosalie (Roberts) Darnell. She married Donnie Lee Cook on May 17, 1959 in Vandalia, IL. He died June 15, 2018. She is survived by her children Terri Potthast of Collinsville, IL, Mike Cook of Marine, IL, and Linda Lurkins of Highland, IL. She is also survived by brother Joe (Barbara) Darnell of Vandalia, IL along with five grandchildren, Andy Potthast, Jessica Freeman, Tracy McEvers, Tucker Lurkins, and Taylor Lurkins and six great grandchildren. She was preceded in death by her husband and a daughter Shelby Miller. She grew up in Vandalia, IL and graduated from Vandalia High School. She and her husband moved to Grantfork after their marriage where they raised their family. 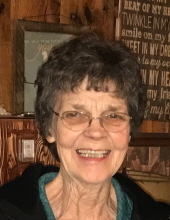 She was a master gardener and a loving mom. She also refereed volleyball for years. To send flowers or a remembrance gift to the family of Carolyn Sue Cook, please visit our Tribute Store. "Email Address" would like to share the life celebration of Carolyn Sue Cook. Click on the "link" to go to share a favorite memory or leave a condolence message for the family.